LOCAL SOLUTIONS ONE COMPANY. ONE CALL. We provide honest inspection report estimates and perform the work too! Fill out the form to my right and start the clock! This form gives us the information we need to provide you or your client with a professional inspection report estimate. This is the Name of the person who will be making the repairs and who would be paying the bill if they go with our services. This is the phone number of the person who will be making the repairs and who would be paying the bill if they go with our services. This is the e-mail of the person who will be making the repairs and who would be paying the bill if they go with our services. 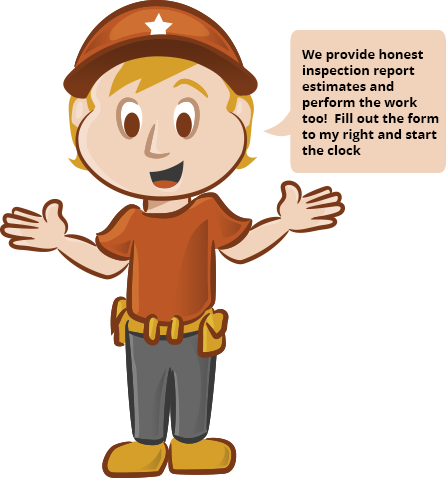 It takes us 2-4 hours to put together an estimate from an inspection report. We detail everything by line item so that you can pick and choose what repairs you want to perform. We feel this is a great service in a time when time is of the essence. Our fees are to cover the costs of re-arranging schedules to meet yours. If we do not meet your schedule, then you do not owe anything. I will send via e-mail attachement. I have included report in the Form Submission below. Using "Browse" button below select the Inspection Report from your computer or follow up this form request with an e-mail to us with the inspection report attached. (please include the address in the subject of the e-mail).